Vietnam’s Foreign Ministry has issued a diplomatic letter demanding the investigation of a Thai Navy boat opening fire at three Vietnamese fishing ships last Friday, leaving one fisherman missing and two others injured. The clash broke out at 2 pm on July 8, when three Vietnamese fishing boats operating in Thai waters were chased by a Thai Navy boat, the Vietnam News Agency reported on Sunday, citing the Vietnamese Embassy in Thailand. The incident occurred at the approximate coordinates of 8oN 102oE in the Gulf of Thailand. The Vietnamese boats had sailed from Ben Tre Province in Vietnam’s Mekong Delta, carrying 18 seamen, according to the same source. The Thai Navy boat reportedly opened fire on the trespassers, injuring two Vietnamese fishermen Nguyen Van Teo, 28, and Nguyen Van Linh, 25, according to First Secretary Nguyen Hai Ngoc, responsible for the protection of Vietnamese citizens at Vietnam’s Embassy in Thailand. Teo had been shot in the right leg while Linh had had his shoulder injured, Ngoc said, with both of them taken ashore by helicopter and held up at a Thai Naval base. Two of the Vietnamese boats collided with the Thai boat and sank, leaving one unidentified helmsman missing. 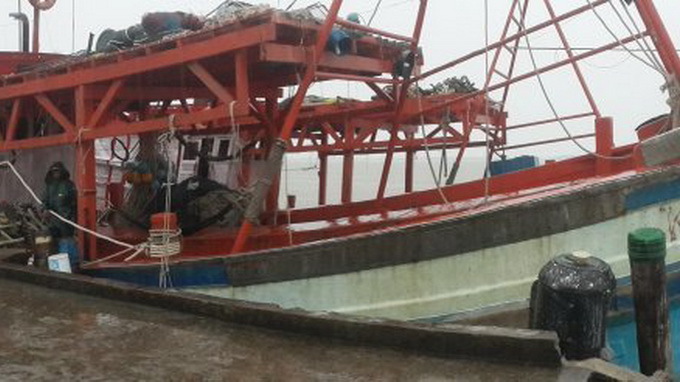 Other fishermen on the sunken Vietnamese ships were rescued and held captive by the Thai Navy boat, which also captured the remaining fishing boat. The fishermen are scheduled to attend court on Monday, with allegations of trespassing and illegal fishing activities. A delegation of the Vietnamese Embassy in Thailand arrived at Songkhla Province in southern Thailand to exercise its duty with regard the legal rights of Vietnamese citizens, the Foreign Ministry said. According to Nguyen Hai Ngoc, shooting at unarmed foreign vessels trespassing a country’s territorial waters is against international law. This is the second time in less than a year that a Thai vessel has opened fire at Vietnamese fishing boats, the last incident occurring in September 2015 when a Thai police boat attacked several Vietnamese fishing ships, leaving one fisherman dead and two others injured. Thai authorities have yet to provide an official response to either incident.